320+ different video audio outputs. Rip DVD to AVI, WMV, MP4, H.264, etc. 350+ profiles for iPhone, iPad, Android, etc. Clone DVD to ISO image/DVD Folder. The license being given away is an older version. Click "Get it Now" to get the setup file and key. Rip DVD to Any Videos. 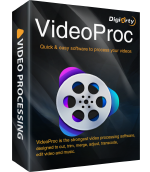 Process, Edit & Convert Videos. Pack with Digiarty's best 3 software which helps you fast clone DVD to DVD/ISO image; rip DVD to MP4, WMV, iOS and Android; convert, compress and edit various kinds of videos; download YouTube playlist/channel; record video for uploading; adjust media file for mobile devices, etc. Lowest price ever! Your purchase on this page comes with a 30-day money back guarantee and lifetime free upgrade. MP3, FLAC, AAC, AC3, WMA, AIFF, A52, A52, MP2, TTA, AXA, VOC, VOC, VOC, VQF, AIF, MPC, MPC, M2A, OGA, M4A, OGG, WV, etc. MP4, H.265, H.264, MPEG, AVI, WMV, VOB, MOV, iPhone, iPad, Android, WP8, Surface, etc. Download videos, music, playlist and channel from 1000+ online sites. 1. The version being giveaway works the same as the Full Version. But it is an older version and won't let you update. 2. Only when you purchase the Full Version can you enjoy lifetime free upgrade and take advantage of all new features and enhanced functions. We'll hold the 30-day money back guarantee if our products cannot normally work with error or bug and we cannot solve it within an acceptable period of time or provide a temporary solution. Note: Our software is for personal use only. Please abide by the laws in your country before ripping/copying DVDs.